The vintage, oval scarf clip is 52.5mm (2 1/8 inches) at its widest point, and roughly 5cm (1 1/2 inches) tall. This scarf clasp is not real silver, it is the color silver. This sturdy metal scarf clip is reliable; it will not crack and break like a plastic scarf clip. 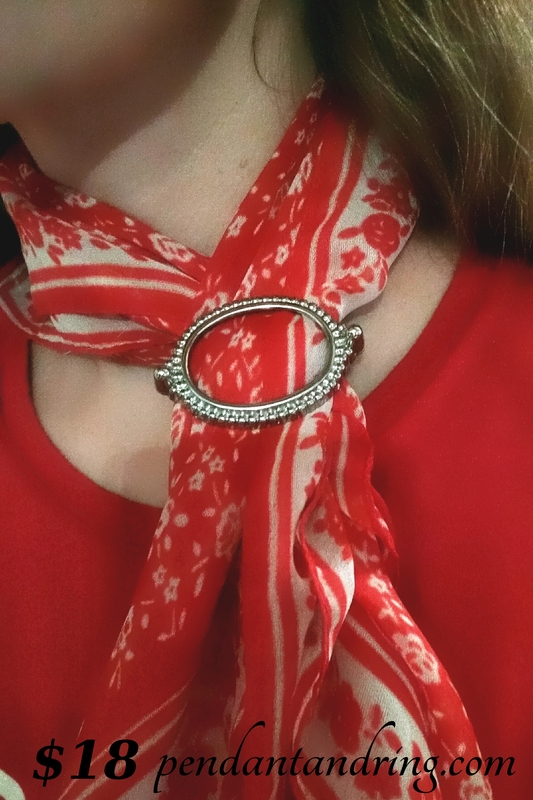 The screws used in the construction of this scarf clasp are easy to loosen for luxurious thick scarves, and equally easy to tighten for thin and silky scarves. On the back there is a hinged loop that holds the opposite end of the scarf in place when you wear it. We published a How To post with pictures that explains how to use this kind of scarf clip. There are many ways to wear a scarf and the image below shows only one way. With everything on Pendant and Ring, we encourage you to wear it your way and share your images with us on social media! !